Join the Kansas City Smoke at the 2014 KC Cross Country Challenge on August 2! Kansas City Track Club members use our KCTC promo code for 5 bucks off. 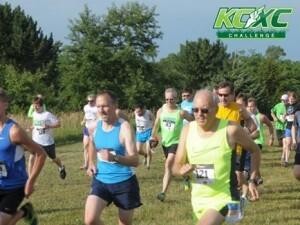 The KCXC Challenge is open to runners and walkers of all ages and abilities and gives you an opportunity to escape the roads and jump on the grass for a unique course at a unique event. Whether you are a high school cross country runner or someone who has always wanted to run a cross country course, everyone is welcome to join us as we celebrate the sport of cross country! This will not be a technical course and is a race for all abilities. The Smoke will be out there in full force. The Cross Country Challenge is a KCTC race series race and KCTC members can earn points for prizes by running or volunteering!